Automatically modulates fans based on cooking load. Modulation allows for energy savings compared to fans running on high speed during cooking operation. Preparation Time Function: Exhaust fans will automatically turn on at low CFM and lock-out dedicated make-up air. Designed for morning operation when light food preparation is being performed. Cool Down Function: At the end of cooking operations, the exhaust fans will automatically turn down to a low CFM and lock-out dedicated make-up air. Designed for equipment cool-down period at the end of the night. Need to update a feature to meet local code? 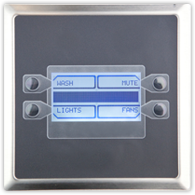 Simply activate the option via the LCD screen. No field rewiring needed. The Electrical Control Panel Model has been certified by ITS. This certification mark indicates that the product has been tested to and has met the minimum requirements of a widely recognized (consensus) U.S. and Canadian products safety standard, that the manufacturing site has been audited, and that the applicant has agreed to a program of periodic factory follow-up inspections to verify continued performance. Models Electrical Control Panel are ETL Listed under file number 101754591COL-001 and complies with UL508A Standards and CAN/CSA C22.2, No. 14-05 Standards. ECPM03 Circuit Board is ETL Listed under file number 100901773BOX-001 and complies with UL 61010-1 Standard and CAN/CSA C22.2, No. 61010-1 Standards.